This is a VERY GOOD+condition example of a scarce variant of the socket bayonet for the Colt Revolving Rifle. This bayonet is shown as Figure 100A on page 87 of Robert Reilly’s seminal workAmerican Socket Bayonets & Scabbards. 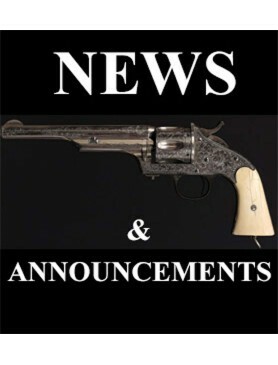 While the socket bayonet most often associated with the Colt Model 1855 Revolving Rifle is of the British Pattern 1853 “Enfield” pattern, Reilly notes that at least one example was known to him that was a US M1855 pattern bayonet. 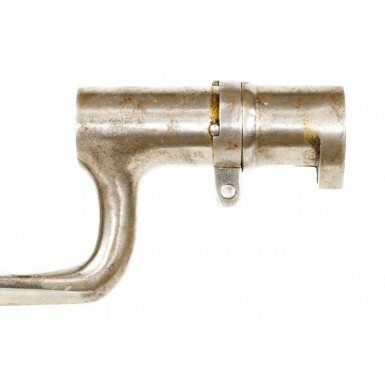 He further notes that in all respects most standard P1853 Enfield pattern socket bayonets and most US M1855 pattern socket bayonets will mount on the M1855 revolving rifle, as the combination bayonet lug/front sight is of the US rifle musket pattern, thus it is the same as on standard US .58 caliber muskets. The muzzle diameter of the revolving rifles is also nominally the same as the US .58 caliber rifle muskets. The key identifying factor for the bayonets is the stamping of the serial number of the gun on obverse socket, in front of the mortise cut. This number was stamped in this location to mate the bayonet to the rifle. 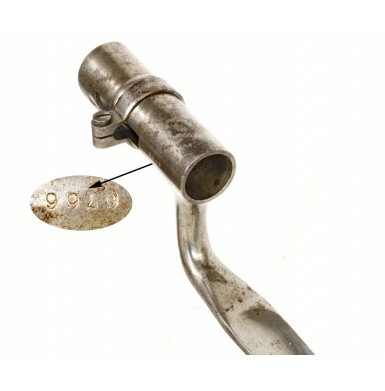 Offered here is a VERY GOOD+condition example of the US M1855 Colt Revolving Rifle Socket Bayonet. The bayonet in all dimensions is nominally identical to the standard US M1855 socket bayonet, and were it not for a specific marking, and the lack of another, it would easily be confused for a M1855 .58 socket. First of all, this bayonet does not have the usual “US” stamped on the face of the blade at the ricasso. This mark is present on all standard US M1855 socket bayonets. However, the mark is omitted from special purpose socket bayonets of the period that would otherwise be easily mistaken for a standard US M1855 bayonet. 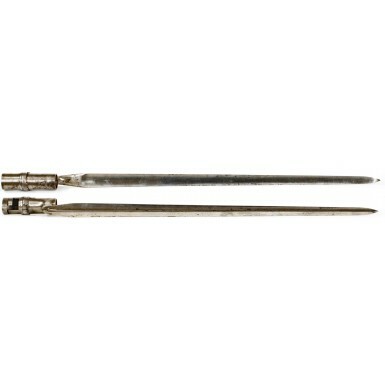 The US M1859 Sharps Rifle socket bayonet and the US M1860 Spencer Rifle bayonets are visually identical to a US M1855 bayonet, with only a slightly larger muzzle diameter and a slightly higher bridge to clear the front sights of these rifles. However, they have no “US” mark on their blades, which allows you to know that you should look closer to see if the bayonet is actually one of the other patterns. This bayonet has no “US”, just like a Sharps or Spencer. Secondly, just like the P1853 style Colt Revolving Rifle bayonets, this one is serial numbered on the socket, forward of the mortise cut. In this case, the serial number is 6766. 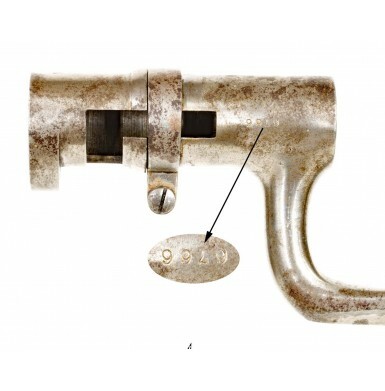 Like the P1853 style bayonets, this number is stamped upside down on the socket, so that the number is legible and reads correctly when mounted on the rifle, with the number running from the front sight towards the muzzle. After consulting the four volume Springfield Research Research Serviceserial number books, I found that most of the Colt Revolving Rifles in the 6,600-6,800 serial number range that were listed were issued to either 2ndMichigan Cavalry or the 9thIllinois Cavalry. The two closest serial numbers to this bayonet that were listed were #6770, which was issued to M troop of the 2ndMichigan Cavalry and #6783, which was issued to L troop of the 9thIllinois Cavalry. While not all of the Colt revolving rifles purchased and issued are listed in these reference books, it is clear that that bayonet was likely issued with a rifle that was probably delivered to one of these two regiments. The only other mark on the bayonet is the inspector’s initial Bon the rear edge of the bayonet. The bayonet conforms dimensionally to a standard US M1855 socket bayonet and were it not for the special markings would not be noted to be a different pattern. The bayonet is full-length and retains the original locking ring and tension screw. The bayonet retains some of its original armory bright finish, which has dulled and faded to a more pewter patina. 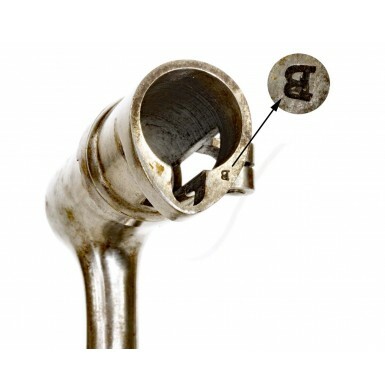 The socket and shank show scattered patches of surface oxidation, some light to moderate roughness and discoloration. This is more prevalent on the socket, and some of it might be cleanable with a little careful effort. The face of the blade shows scattered flecks of surface oxidation and age discoloration, with more present on the reverse of the blade and more evenly distributed oxidation along the edges of the blade. The locking ring remains fully functional and moves smoothly. 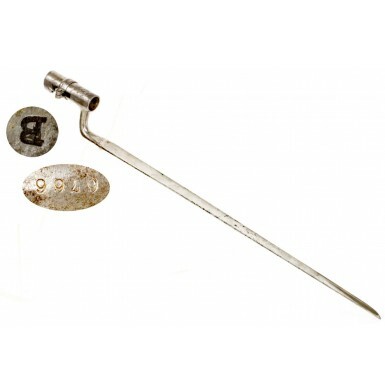 If you have a Colt revolving rifle, this scarce bayonet would be a fine addition to the gun. These bayonets rarely appear for sale and this is a solid example in very nice condition that would be a wonderful addition to your gun, particularly if your gun was either a 2ndMichigan or 9thIllinois volunteer cavalry gun.